Having made the background piece while testing out the Silver Embossing paste(new in the 2018 Occasions Catalogue), I was left with the dilemma of what to do with it! 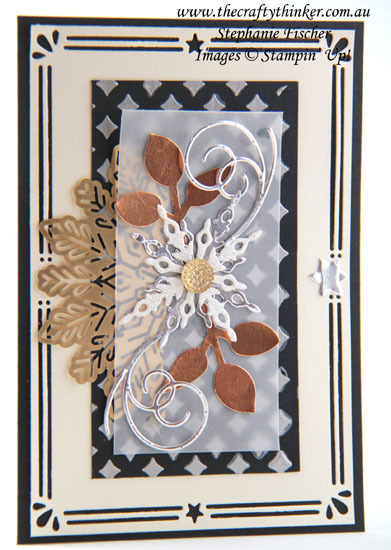 My thanks to Peggy Noe at Prettypapercards who inspired me with her Pretty Tags. To the Basic Black base card I added a layer of Very Vanilla cut with the Card Front Builder dies. 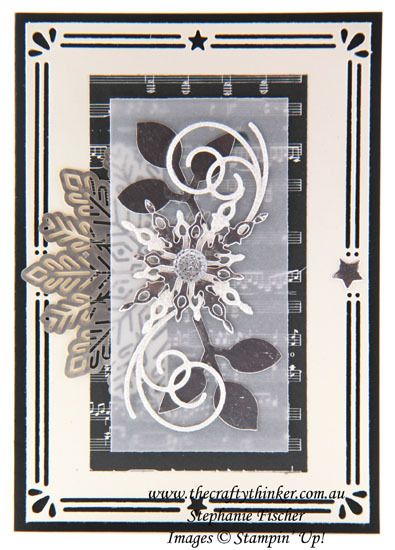 I layered a piece of Vellum on top of the embossed piece along with half of a Foil Snowflake embellishment, a couple of flourishes cut with one of the Swirly Snowflake dies, two of the snowflakes from the Starlight dies (one in Dazzling Diamonds Glimmer paper and one in Silver Foil) and two Leaves cut from either Silver or Copper Foil Sheet with the Leaf Punch. 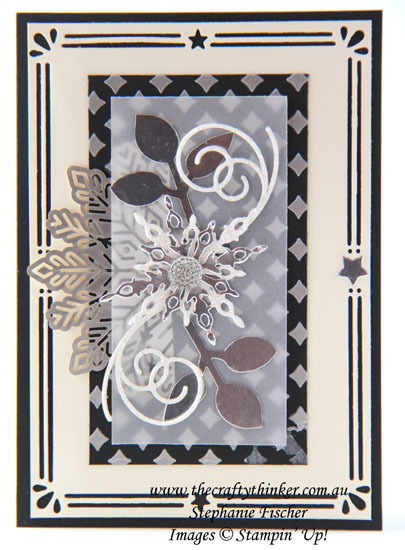 I also added a Silver Foil Sheet star to the card front that I cut with one of the Ready For Christmas dies. And, of course, there's the faceted gem in the centre of the snowflakes. I liked the outcome so much that I made a dozen more for our staff members, using pieces of the Merry Music Designer Series Paper instead of the home made embossed background.